On the final morning of the Olympic track cycling competition - a "competition" his team had almost completely subverted - British Cycling's performance director Dave Brailsford went on BBC Breakfast and gave the game away. So Dave, came the question, tell us about these "marginal gains" that underpin everything you do? "The whole principle came from the idea that if you broke down everything you could think of that goes into riding a bike, and then improved it by 1%, you will get a significant increase when you put them all together," he explained, without looking at all like the evil mastermind of a mysterious sect. "There's fitness and conditioning, of course, but there are other things that might seem on the periphery, like sleeping in the right position, having the same pillow when you are away and training in different places. "Do you really know how to clean your hands? Without leaving the bits between your fingers? "If you do things like that properly, you will get ill a little bit less. "They're tiny things but if you clump them together it makes a big difference." 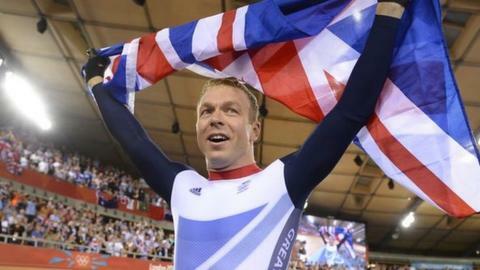 Britain have won seven out of 10 track cycling gold medals in London - matching their achievement from Beijing 2008. So the secret of British cycling's success is taking your own pillow with you when you travel, and cleaning your hands properly. Sorry, Dave, but that's not going to wash with the opponents you have just steamrollered for the second Games in succession. They want cheating, they want witchcraft, they want an excuse. The day before, French newspaper L'Equipe had run a story based on claims of skulduggery from Isabelle Gautheron, the French team's boss. She said the British were supposed to be using the same wheels her team got from the French company Mavic, but they could not be the same because the Brits were going so much faster than her riders. When asked about these "magic" wheels, Brailsford told L'Equipe they were "round". And yet still the vanquished were not satisfied. New Zealand's keirin bronze medallist Simon van Velthooven was full of praise for the man who had just beaten him, Sir Chris Hoy, but could not help wondering if the race might have turned out differently if they swapped bikes. And in the media conference after he had just been bested in a sprint by Britain's Jason Kenny for the first time, Gregory Bauge of France - a seven-time world track cycling champion - took the microphone to ask the British sprinter how he had prepared for the race. Kenny's answer was a masterpiece of understatement: "Erm, I don't know, hard work, I guess", was the gist of it. The Bolton-born lad would make a great spy. Bauge would have been better off attending the final set of media conferences on Tuesday, because there he would have heard Sir Chris Hoy and Victoria Pendleton talk about the enormous sacrifices and superhuman efforts that members of the British team are expected to make. Hoy, who trains 35 hours a week and dare not even walk to the shops as he is meant to be recovering for his next session, laughed off the conspiracy theories. "It's hard to explain what makes the team so special," the six-time Olympic gold medallist said. "It's all of it, the science, the training, the coaches, but most of all we point the mirror at ourselves and ask 'how can we get better?'" Moments before, a tearful Pendleton, who had to in her last-ever appearance in a velodrome, simply voiced her relief that it was all over. No longer would she have to spend hours in wind tunnels refining her body position on the bike, no longer would she have to squeeze into seamless "skin suits", no longer would she have to keep up with the Joneses, particularly when the Joneses were all Olympic champions. "Steve Peters [the psychologist Brailsford brought in to help his riders just before the Athens Olympics] has a saying," Pendleton explained. "You have to be somewhere between exceptional and phenomenal. "That's tough. It's difficult to maintain those standards. Chris Hoy manages it but I found it hard." To be honest, even Hoy sounded like he found it hard, when later on he painted a picture of personal happiness that involved watching the Olympics on TV with "a beer and a bowl of crisps". But these comments, and others like them, revealed the real truth behind Britain's emergence from cycling also-rodes to pedalling superpower. They are not ashamed to look elsewhere for answers. The "pillow" idea apparently came from the Royal Ballet, the emphasis on hygiene is the result of talking to surgeons about avoiding illness, Peters was dividing his time between academia and patients at the high-security Rampton Hospital when Brailsford invited him in. There is no arrogance at British Cycling; they know they can do better. And that is what should really worry the opposition. They might not have to race Pendleton again, or Hoy for much longer, but Kenny, a triple Olympic champion, is 24, team pursuit gold medallist Dani King is 21, Laura Trott, a double Olympic and world champion, is 20, and team sprint gold medallist Philip Hindes is 19. And these are just the young talents who have exploded onto the world scene already. Yes, British Cycling is wealthy - no other sport has quite so enthusiastically bought in to British sport's "medals mean money" funding model - but it is also good with its cash. There is nothing flash about the sport's Manchester HQ, unless you consider the best coaches, nutritionists, sports scientists, bike technicians, psychologists and so on, to be luxury items for a professional team operating at an elite level. And for as long as they keep winning nearly 80% of the races they compete in at Olympic track meets, these highly competitive people will continue to want to work here. It also creates headlines, attracts sponsors and drives participation numbers up. They talk a lot about cycles in Olympic sport; British Cycling is in the midst of the most virtuous one imaginable. But there is one other element to consider. You do not back up a performance like Beijing with one like London, if you are unwilling to make tough calls, such as picking Kenny for the individual sprint ahead of reigning champion Hoy. The famous American basketball coach Pat Riley once said "coaches who let championship teams back off from becoming a dynasty are cowards". Nobody would ever accuse Brailsford, Sutton, Van Eijden and co of being afraid to make difficult decisions about selection or strategy, just as nobody, even the French, would doubt that Britain's Olympic cycling team has become a dynasty.